There are many seemingly conversational topics that can be interpreted as illegal when asked during an interview. Something as simple as, “Oh, I grew up there too!” can be interpreted as a potential bias and thus would fall under an illegal interview question. Please note that this article contains general information, and we suggest consulting your own legal professional for specific advice pertaining to your interview process. You’re not a Muslim, are you? You’re not gay, are you? We see you graduated from high school in 1971, do you plan on retiring soon? You cannot ask someone how old they are, AND you cannot discriminate against someone who seems too old or too young. It does not apply to how well someone can do the job. You may ask, however, what their 5-year career plan is. If you’re a mother, will you have to leave early every day or avoid travel? You cannot ask this question and cannot discriminate against a woman because she has children. You cannot ask about childcare. You can, however, ask if working late or traveling on weekends will be okay with the candidate. Many retail companies who are hiring people for consumer-facing roles often make the mistake of asking this question to interviewees from other countries. The fact is, though, it’s not actually an employer’s lawful right to know if a language is a person’s first language or not. 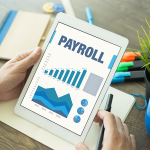 From our HR expert: Please note that many companies do ask the above question. Instead, they should ask, “Are you native-level fluent in English?” Or have a candidate rank themselves from 1-5 with 5 being fluent in English. What arrangements are you able to make for childcare while you work? What does your wife/husband/partner do for a living? Where did you live while you were growing up? Are you comfortable working for a female/male boss? How long do you plan to work until you retire? But what about if you have a candidate who volunteers information around the above questions, even if you didn’t ask them? That happens all the time. What About When A Candidate Tells Me Something Inappropriate? People overshare these days— on social media, in line at the grocery store, and during interviews too— especially when a candidate is nervous and has a rush of adrenaline. Pause in your answer to them. Make solid eye contact in order to ensure your point will get across. Say something like, “Let’s stick to the set of questions I have here, we are short on time” and move right onto the next question. If the candidate goes there again, you can be more firm and say, “we unfortunately are going into personal details. I’ll ask you to stick to answering the questions at hand, please”. If the candidate still continues down oversharing lane, I would advise you to potentially even end the interview short as politely as possible. This indicates that they aren’t listening, or that they are looking for you to open an illegal can of worms. At worst, they could be a lawsuit seeker. The best way to avoid asking illegal interview questions or just bad ones, is to be prepared. Knowing how to interact with candidates at each step of the process will keep will keep the spontaneous chit-chat to a minimum— when a slip-up is most likely to occur. The best prepared employers will use a system to structure their interactions. If you’re hiring through Indeed, our recommended job board, they provide all the tools you’ll need to achieve this: First, use Indeed to write a simple and professional job description that minimizes potential risks from the start. Once applications come in, you can use Indeed’s email templates to quickly send pre-written acceptance or rejection messages — again, helping you save time, and keep your interaction professional and predictable. When it comes time to run the actual interview, we highly recommend following a structured interview process where you prepare a list of questions, and ask those some questions to each candidate. You can then use an interview evaluation scorecard to track responses. This not only keeps your interviews on-point, but it makes it easier to compare candidates and ultimately make a hiring decision. Your job description is often the first thing a candidate reads about your business — and thus, in a sense, is your first “interaction” with them. Just as you would greet a new visitor to your business with professionalism and respect, your job ad should do the same. If there’s any perceived bias in your job description, it can easily spill over into the rest of the hiring process. Similarly, a questionnaire on your application lets you ask candidates important questions right away, such as, if they hold a certification, or meet a language or educational requirement. Indeed includes an optional questionnaire-builder when you post a job ad. This makes it easy to ask these questions in a straightforward and professional manner. You can get these key interview questions out of the way early, and in a way you know will be compliant. 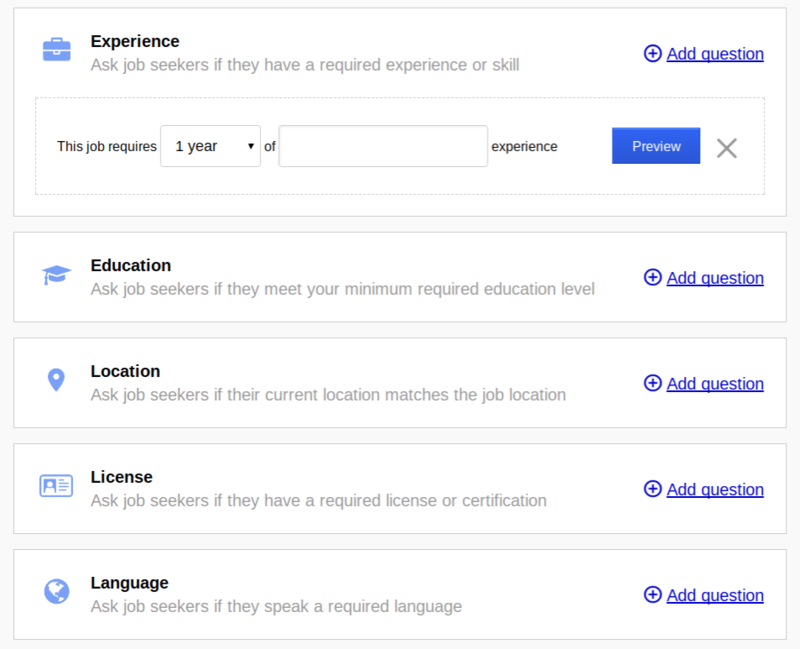 Indeed makes it easy to add required questions to your job application. A questionnaire also ensures candidates are aware of your requirements right away, and that no under-qualified applicant “sneaks” onto the shortlist. When you get a lot of applicants, it can be overwhelming to personally respond to each and every one. 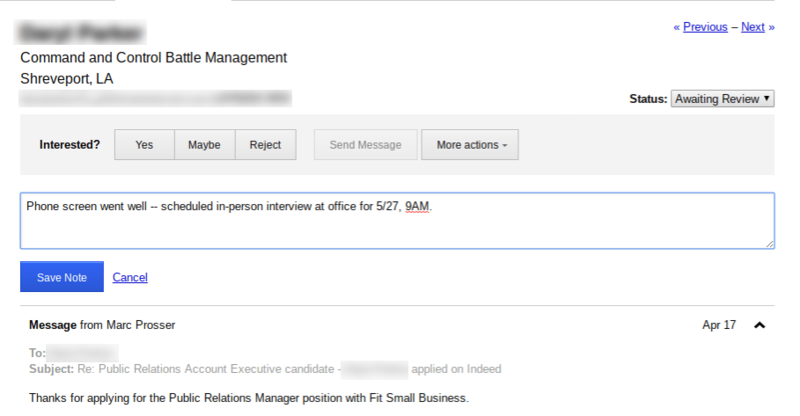 Instead, you can use email templates to quickly follow-up with each candidate. One template should invite them to the next step in the process (typically, a short phone interview). Another should thank them for applying, but inform the candidate that they will not be considered. A third email template, sent to your ‘maybes,’ should let them know you’ll be responding with a decision soon. 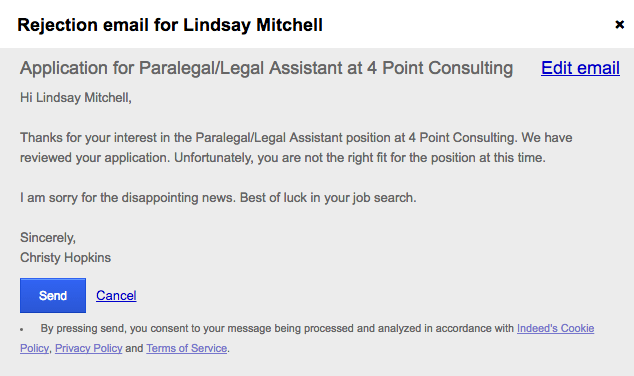 Indeed provides classy email templates, which you can send with one click from a candidate’s application. Again, email templates take the spontaneity out of your interaction. Especially if you have multiple team members reviewing applications, it’s always better to error on the side of safety, and keep your interactions predictable. Before conducting your main job interviews, it’s important to schedule short phone interviews with your top candidates. These can be anywhere from 5 to 30 minutes, and your goal is simply to determine whether or not you want to proceed to a longer in-person interview. Phone screens save you time, since you can rule-out any unsatisfactory candidates right away. This will also make your in-person interviews easy, as you’re less likely to be in any awkward or unpredictable situations. As with any other step in the hiring process, phone screens are a time when illegal interview questions can accidentally slip. To avoid this, keep the conversation focused on the candidate’s resume, including their work history and qualifications. Remember that even seemingly relevant questions, like, “when did you graduate from college?” can be unlawful because of their implication (age-bias). Be sure to check out our top 51 phone screen questions to help you come up with ideas. When it comes time for your main, in-person job interviews, you can error on the side of caution by conducting structured interviews. A structured interview is when you ask the same questions to every candidate. As long as you’re careful in selecting your questions, this method is nearly air-tight for mitigating liability. Ideally, you should ask the same questions in the same order. 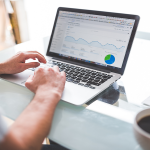 Because the conversation can vary depending on a candidate’s response, you’ll also want to have a list of follow-up questions prepared, which you can roughly emulate for each candidate. As a result, you’ll be able to more easily compare and rank candidates, based on their responses to the questions. Check out our full guide on conducting a structured interview, including a free template with questions or use one of 11 interview evaluation forms. Last but not least, make sure you’re taking thorough notes during the interview, and throughout the rest of the hiring process. Have your list of questions handy, and write (or type) the candidate’s responses to each question. Indeed allows you to save notes directly on a candidate’s application. The primary reason is to aid your memory when it comes time to compare candidates and make a hiring decision. Using Indeed, you can save notes directly on the candidate’s application, so you have all the important information organized in one place. This is especially helpful when you have multiple hiring managers reviewing candidates. The other key reason to save notes is that you’ll have a clear justification for your hiring decision. In the event you’re charged with making a biased decision, and/or asking an illegal interview question, your notes will serve as your best defense. Illegal interview questions can make for funny stories, until you’re on the other side as a business owner and facing a lawsuit. It is very easy to get distracted during an interview and that’s why we recommend preparing as much as possible. Implementing a structured hiring process using a system like Indeed will keep your conversations on-point from the very beginning. It can also help you make better hiring decisions, because you can more easily rank candidates based on their responses to the interview questions. Be sure to check out our free webinar that will help you find the best candidates on Indeed.